Review | Chevrolet sells cars in all sorts of shapes and sizes. However, they all have one thing in common: they are all excellent value for money. However in America, Chevrolet offers even much more, such as unique cars like the HHR. The men in the boardroom thought that it was high time to introduce this car to Europe. A good idea? 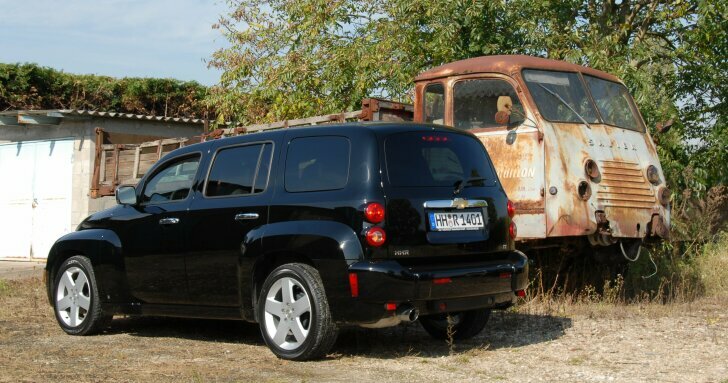 In its own words, Chevrolet was the inventor of the Multi Purpose Vehicle (MPV) back in 1949. 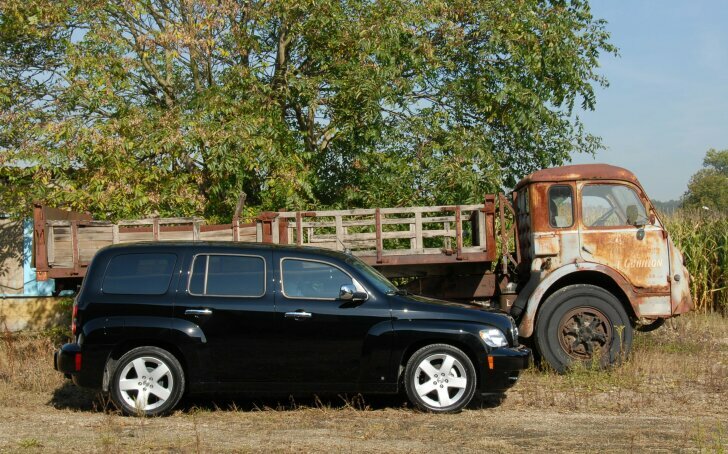 The car was called the Suburban; it was the inspiration for the most recent HHR. Retro-lines, double rear-lights, broad wheel housing, running boards and large chrome grille leave no doubt about this HHR's origins. This is a flamboyant display of Americana. With its high shoulder-line and low side windows, there is an impression of a low car, whereas the HHR is in fact very high and very roomy. As the original model was intended as a practical car, the new HHR offers more than just its exterior appearance. With 4m48 of space, Chevrolet has a lot of space and a lot of practical possibilities. The sturdy plastic loading floor is adjustable in height, allowing the luggage space to be divided into two levels. Under the loading floor, two extra compartments are also located. The back seat can be folded down in two parts (with a 60/40 ratio), increasing the luggage space to 1,634 litres, more than most estates! Finally, the front passenger seat can also be folded down, which means that objects measuring up to 2,44 meters can fit in the HHR. The HHR has high seats, which facilitates getting in and out, as well as providing a good overview of the traffic. The standard leather clad seats are large and adjustable in all directions (only the right one is electronic). Both the space in the front and the rear is generous. The optional sunroof reduces the head space considerably, which is not ideal for the taller driver. There is good visibility in the HHR when parking and manoeuvring, however the extremely large side mirrors do require some familiarisation. Due to safety issues, nostalgia is no longer evident in the interior, although it does look exceptionally good. The modern interior is provided with all the essentials, certainly when the price is taken into consideration. Air conditioning, remote central locking, an onboard computer, tinted windows, heated seats, electronic side windows (both front and rear) and a good audio system are all standard. The radio/CD player not only sounds very good, there is also an MP3 player! 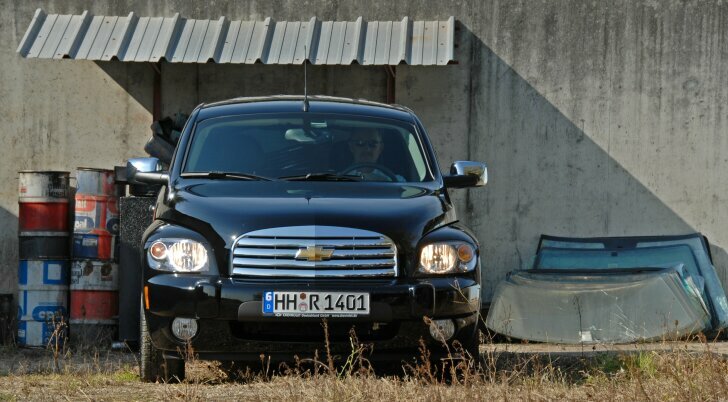 Chevrolet has delivered the HHR with only one engine type in Europe. This is neither a crafty turbo engine (which is currently being researched!) nor a greedy European revving machine; but a typical American engine which is designed with maximum comfort in mind. The four cylinder engine provides a modest 170 bhp and 224 Nm of torque in spite of considerable 2.4 litres capacity. Due to its substantial weight, the moderate streamlining and attempts to achieve a low consumption, the performance of this engine is mediocre. The HHR is not pronouncedly slow, but lacks any back-up to overtake or merge into traffic quickly. The American manufacturer has been successfully in its pursuit of comfort. Thanks to the so-called dual balancer shafts, the engine runs without any vibration. The HHR is remarkably quiet. Not only is the engine barely audible, there is very little noise from the exterior wind or tyres. Especially for the European customer, the HHR has the choice of either a four-speed automatic or a five-speed manual gearbox. It is hardly surprising: this car which was built for America drives exactly like an American car. The steering is circuitous, with the whole car shifting considerably in sharp turns. However, road handling is considerably better (read: much safer) than that of American budget cars. Both traction control and an electronic stability programme (ESP) are standard. The longer the test drive goes on, the more the HHR is capable of stealing not only the heart but also the trust of its test driver. 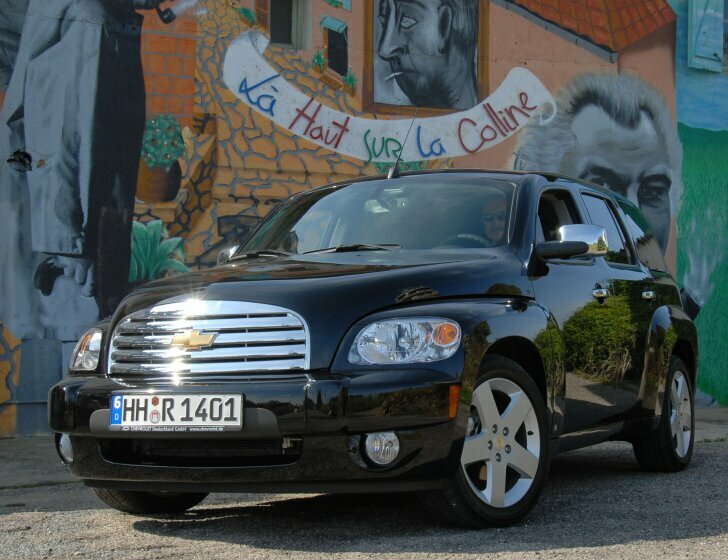 Was it such a good idea that Chevrolet introduced the Heritage High Roof (HHR) to Europe? The answer is "yes" but it's also "depending on the buyer." Yes, because Chevrolet no longer has a spacious mid-sized car, thus the HHR is an extremely welcome supplement to its existing range. The HHR not only offers more space than the average estate, it is also more efficiently utilised. Just like other Chevrolets, the HHR has also been competitively priced. Since the HHR was introduced onto the European market with its unadapted, American-orientated design, the car drives like a real piece of America. Whether this is good or bad thing is a question of taste. Everything is comfort-orientated. A large but calm and modest engine delivers a road handling that is comfortable and well-behaved.